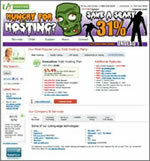 A2hosting Web Hosting Win a $25 Free Hosting credit! Are you an A2hosting customer? Interested in entering the drawing? Just add/paste a “Web Hosting By A2Hosting” link on your website and fill out the entry form then you will be entered into A2hosting monthly drawing to win a free $25 hosting credit. Only enter once! This contest is open only to individuals who were 21 years of age at the time of entry. All federal state, provincial and local laws and regulations apply to this contest. Entries begin at 12:00AM EST 11/01/2009 and close at 12:00AM EST 11/30/2009. Entries received before or after this deadline will be rejected. The winner will be notified no later than 12/10/2009 by e-mail. Once an Entry is submitted, all entries will be collected by A2hosting. On the first business day of each month, A2 hosting will choose one Entry from all entries whose HTML script remains functioning. The winner will receive a $25 hosting credit applied to their next monthly invoice or their next invoice.